After the success of the workshops on the 17th of November, we are pleased to say that Adrian Nelhams is going to be running 4 more dry tooling workshops at the centre. Kendal Wall has developed a fantastic dry tooling facility. 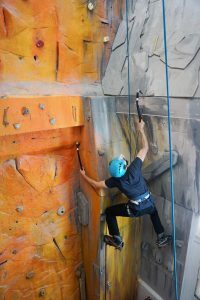 If you wanted to ‘have a go’ at dry tooling and/or wanted to improve your dry tooling skills, but didn’t get a chance at the Kendal Mountain Festival as all the workshop session were full then read on…. Adrian Nelhams BMG Mountain Guide from ISM (International School of Mountaineering) who ran the sessions in conjunction with Kendal Wall and supported by Arc’teryx are putting on some more workshop dates to help prepare you for this winter. You must be aged over 18 to take part in this workshop and be a competent top rope belayer. The workshops will be in the evenings from 7.00 – 8.30pm. Cost: £5.00 (100% goes to Mend our Mountains the BMC campaign) on top of normal wall entry. Equipment: It’s not essential, but if you do have them, please bring along your own crampon compatible mountain boots, a harness, a belay plate, ice axes and crampons.